Warren Ellis' satirical-political science fiction novel begins with a simple question: Where is the Future We Were Promised? But the man asking the question is not going to be content until he's taken apart the very city of Heavenside to find the answer! 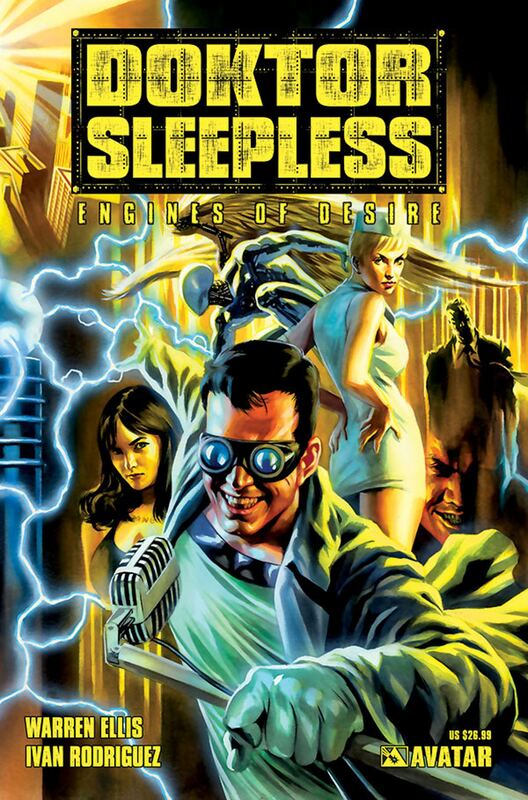 Doktor Sleepless and his sultry and murderous Nurse are broadcasting non-stop intrigue to a city populated with beautiful Shrieky Girls, angry Grinders, corrupt police, and the Doktor's old flame Sing Watson, perhaps the only person who really knows how dangerous things are about to get. You may not have your jetpack, but the good Doktor has just the prescription you've been looking for!